In previous installments of this three-part series, our colleagues explored how the shift in the U.S. from volume- to value-based healthcare reimbursement has 1) facilitated trial sponsor willingness to integrate payer community points of view by including value-oriented endpoints and other real-world evidence-generating strategies into early clinical development activities (read Part 1), and 2) placed added pressure on sponsors to reduce price while increasing overall drug benefit delivered to patients. One way to drive this is by extracting greater value from pipeline candidates by mitigating failure risks through identification and development of biomarker-based patient stratification strategies in clinical research (Part 2). In this final series installment, we focus on oncology biomarker-based companion diagnostic tests, the evolving reimbursement landscape, and future considerations for clinical trial sponsors. Drug and device manufacturers have focused on securing the necessary preclinical, clinical, safety, and efficacy data to support regulatory approval, followed by real-world adoption in clinics. In a new U.S. value-based healthcare environment, patient access at the clinic is impacted by other key stakeholders, such as healthcare systems, public and private payers, and self-funded employers. These stakeholders’ considerations are not limited to just the clinical trial safety and efficacy of the products, but also include unmet clinical needs, real-world clinical efficacy, patient-reported outcomes, budgetary impact, pragmatic considerations, and emerging industry trends. Not to be forgotten is the voice of the patient in this time of high-deductible health plan products, as the patient becomes a payer, and cost-share affordability can impact access. Leveraging companion diagnostics on a large scale can be the game-changer that enables precise therapies to deliver high-quality outcomes and overall value for patients and health system payers. Biomarkers can be prognostic, in that they provide information on the risk of disease progression or other disease characteristics, some are predictive to identify those most likely to benefit, and others are selective in that they can rule out those who will not benefit from a therapy. Just 20 years ago, the FDA approved the biologic Herceptin® (trastuzumab) for breast cancer use in tandem with the first biomarker-based companion diagnostic test, the IHC HercepTest™ for human epidermal growth factor 2 (HER2) overexpression to inform patient selection for Herceptin therapy.6 HER2 testing is even more relevant now, as use has expanded outside of breast cancers. Physicians routinely look to biomarker-based companion diagnostics to identify molecular variations, including ALK, EGFR, RAS, BRAF, and PD-L1 to direct treatment decisions, while others are used for monitoring (e.g., BCR-ABL in CML). Lack of available tissue to run a companion diagnostic test and a patient who is not a good rebiopsy candidate can present a challenge. Now, an FDA-approved option is a liquid biopsy that detects circulating tumor cells or circulating cell-free tumor DNA in blood samples. A list of FDA-cleared or approved companion diagnostic devices, including several NGS tests, can be found at https://www.fda.gov/MedicalDevices/ProductsandMedicalProcedures/InVitroDiagnostics/ucm301431.htm. In the U.S. reimbursement landscape, evidence-based guidelines are driving toward clinical treatment pathways, along with comparative effectiveness tools, total cost of care models, emerging value frameworks, and reports from the Institute for Clinical and Economic Review all converging with the shift toward testing novel payment models. Stakeholders are looking for therapies to provide evidence of incremental benefit over existing options, especially when a new agent has significantly greater cost. The co-development of a companion diagnostic for more precise patient selection may enhance support for payer policies and provider adoption. 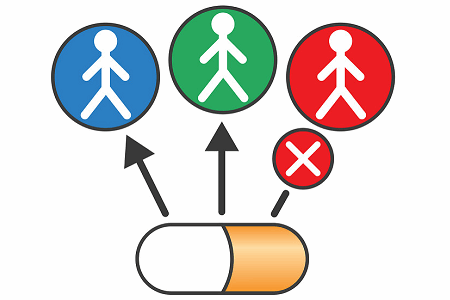 For example, while policies vary, if a drug has a companion diagnostic in its label, a commercial payer generally covers the test and services to perform it. The test will likely be added to prior authorization criteria for the drug, where a payer can ask for provider attestation, or the actual test result, prior to drug approval. Reimbursement for companion diagnostic tests is complex and as dynamic as the scientific process. The complexity itself presents a challenge. Medicare coverage and fee schedules are crucial for drugs and diagnostics, as they not only affect Medicare beneficiaries, but they serve as a basis for most private commercial payer policies, especially in oncology. Coding also presents challenges as reimbursements may be impacted by the timing between a test clearance and availability of a billing code, causing delayed payments. Further, the coding itself may be challenging to identify an individual test, as they are based on the type of test or complexity of lab processes (e.g., IHC, PCR, FISH) and not the individual assay or specific test. This coding structure can lead to potentially inadequate reimbursements for some tests.13 Under the MolDX program, there are different code options based on the number of genes in a test panel. One new development has a positive impact on NGS testing reimbursement. In November 2017, the FDA approved Foundation Medicine NGS test F1CDx and CMS concurrently issued a preliminary National Coverage Determination (NCD) for F1CDx and other advanced diagnostic laboratory tests. The decisions came after the FDA and CMS considered the test under their Parallel Review Program. F1CDx is only the second IVD to be approved and covered as part of that program. Since many commercial payer policies follow CMS rulemaking, how CMS handles coding and reimbursement is relevant. Payers have not been keen to reimburse for NGS testing given the high cost, multiple results without actionable therapies, and less expensive FDA-approved alternative companion diagnostic tests for certain actionable mutations being tested. The new regulatory focus of the FDA and CMS to streamline and coordinate their scientific and reimbursement reviews of new therapeutics and associated companion diagnostics, respectively, should be encouraging to sponsors. Current and new basket trials are critically important to support new scientific discoveries that continue at a record pace. Sponsors can benefit from developing a clear companion diagnostic strategy, including opportunities to engage in test development of more than one platform or assay. Seeking early regulatory input and reimbursement planning is essential for overcoming reimbursement barriers. A close interdependent working relationship and clear communication between drug and device manufacturers is essential. Proactive public and private payer engagement strategies will support the likelihood that sponsor goals for reimbursement coverage of both the drug and the test will be met. Barker RW. Is precision medicine the future of healthcare? Per Med. 2017;14(6):459-461. Personalized Medicine Coalition. Personalized Medicine at FDA: 2017 Progress Report. http://www.personalizedmedicinecoalition.org/Userfiles/PMC-Corporate/file/PM_at_FDA_2017_Progress_Report.pdf. Accessed June 25, 2018. America’s Biopharmaceutical Companies. Medicines in Development: 2018 Report. http://phrma-docs.phrma.org/files/dmfile/2018_MID_Cancer.pdf. Accessed June 25, 2018. Personalized Medicine Coalition. The Personalized Medicine Report: 2017 Opportunity, Challenges, and the Future. http://www.personalizedmedicinecoalition.org/Userfiles/PMC-Corporate/file/The-Personalized-Medicine-Report1.pdf. Accessed June 25, 2018. U.S. Food and Drug Administration. List of cleared or approved companion diagnostic devices (in vitro and imaging tools). https://www.fda.gov/MedicalDevices/ProductsandMedicalProcedures/InVitroDiagnostics/ucm301431.htm. Last updated June 13, 2018. Accessed June 25, 2018. Mansfield EA. FDA perspective on companion diagnostics: an evolving paradigm. Clin Cancer Res. 2014;15(20):1453-1457. Day D, Bedard PL. Beta-testing of next-generation DNA sequencing for patients with advanced cancers treated at community hospitals. J Oncol Pract. 2016;12(4):279-281. U.S. Food and Drug Administration. In Vitro Companion Diagnostic Devices: Guidance for Industry and Food and Drug Administration Staff. https://www.fda.gov/downloads/MedicalDevices/DeviceRegulationandGuidance/GuidanceDocuments/UCM262327.pdf. August 6, 2014. Accessed June 25, 2018. U.S. Food and Drug Administration. Companion diagnostics. https://www.fda.gov/MedicalDevices/ProductsandMedicalProcedures/InVitroDiagnostics/ucm407297.htm. Last updated December 28, 2017. Accessed June 25, 2018. U.S. Food and Drug Administration. FDA In Brief: FDA advances policy to make co-development of drugs and diagnostics in cancer trials more efficient.
. April 12, 2018. Accessed June 25, 2018. Centers for Medicare and Medicaid Services. PAMA regulation. https://www.cms.gov/Medicare/Medicare-Fee-for-Service-Payment/ClinicalLabFeeSched/PAMA-Regulations.html. Page last modified March 23, 2018. Accessed June 25, 2018. Ray T. CMS 2018 PAMA pricing cut for lab tests deeper than prior estimate; advanced Dx lab tests fare well. https://www.genomeweb.com/molecular-diagnostics/cms-2018-pama-pricing-cut-lab-tests-deeper-prior-estimate-advanced-dx-lab#.Wy7hbchrxZp. September 22, 2017. Accessed June 25, 2018. Jean NS, Pinto C, Tenente I, Murray G. Collaboration is key to accelerating diagnostics access to optimize benefits of precision medicines. Per Med. 2018;15(3):157-161. Centers for Medicare and Medicaid Services. CMS finalizes coverage of next generation sequencing tests, ensuring enhanced access for cancer patients. https://www.cms.gov/Newsroom/MediaReleaseDatabase/Press-releases/2018-Press-releases-items/2018-03-16.html. March 16, 2018. Accessed June 25, 2018. National Cancer Institute. NCI-MATCH Trial (Molecular Analysis for Therapy Choice). https://www.cancer.gov/about-cancer/treatment/clinical-trials/nci-supported/nci-match#h. May 21, 2018. Accessed June 25, 2018. Janet T. Serluco, MS, is VP of Payer Access Solutions and the oncology lead for Precision for Value. She joined Hobart Group Holdings, a Precision Medicine Group predecessor company, in 2013. Serluco has more than 20 years of expertise in market access, specialty pharmacy, marketing insights and strategy, brand management, and communications, with a focus in specialty and biologics, particularly oncology. Elizabeth Oyekan, Pharm.D., FCSHP, CPHQ, is senior director of Quality and Population Health Solutions for Precision for Value. She brings more than two decades of industry experience to the PFV team. Prior to joining PFV, Oyekan was the VP of operations and quality with Kaiser Permanente in Colorado, where her responsibilities included oversight of the Primary Care and Specialty Service Lines, Population Management and Complex Care services and solutions, and Analytics and Project Management Services.